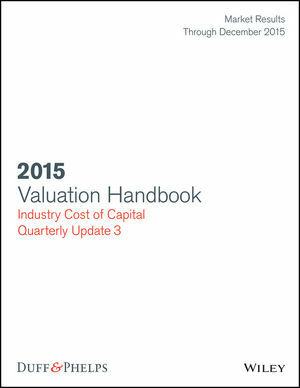 This is a quarterly update to the 2015 Valuation Handbook: Guide to Cost of Capital with market results through December 31. 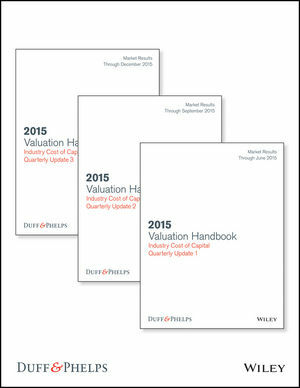 Data updates, IRPs and betas are provided throughout the year for the Valuation Handbook. The handbooks and their updates deliver critical data points relating to U.S. industries. The information can be used to benchmark, supplement or support additional analysis of the industry. The handbooks themselves are produced by Duff & Phelps LLC. They include discussions about valuation theory, cost of capital estimation models, industry risk premium and other factors. Roger J. Grabowski is managing director of Duff & Phelps LLC. Roger has testified in court as an expert witness on the value of closely held businesses and business interests, matters of solvency, valuation, and amortization of intangible assets, and other valuation issues. He testified in the Northern Trust case, the first U.S. Tax Court decision that adopted the discounted cash flow method to value the stock of a closely held business with the discount rate based on the capital asset pricing model. Grabowski authors the annual Duff & Phelps Risk Premium Report.